Delicious Drip: Son C. | Pulp and Circumstance, Juiced. Frightened Rabbit, go grab yourself the award for brilliant marketing. The band, which has consistently impressed ere humble blogger this past year with their latest record, The Winter of Mixed Drinks, is releasing a yummy little bundle. 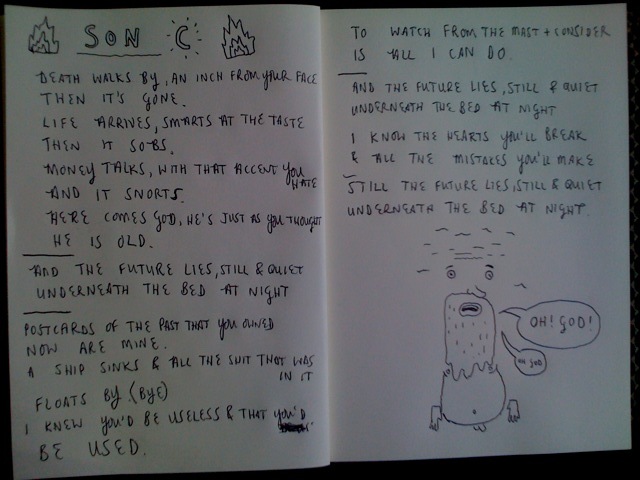 Despite being on tour for most of this year, they managed to knock out a new tune “Son C”; and as part of the entire free package, you get snaps of summer touring and the cheeky photo of the original lyric writing, complete with amazing little drawings. “Son C” is a haunting, melodic little tune–with a bang up drum beat and plenty of orchestration. It’ll be perfect for fall, whence it comes around shortly. Go grab the (free!) bundle here. Frightened Rabbit will hit Boston on October 29 for a gig in the Paradise. Expect P&C there. This entry was posted in Delicious Drip, jwolf and tagged frightened rabbit. Bookmark the permalink.